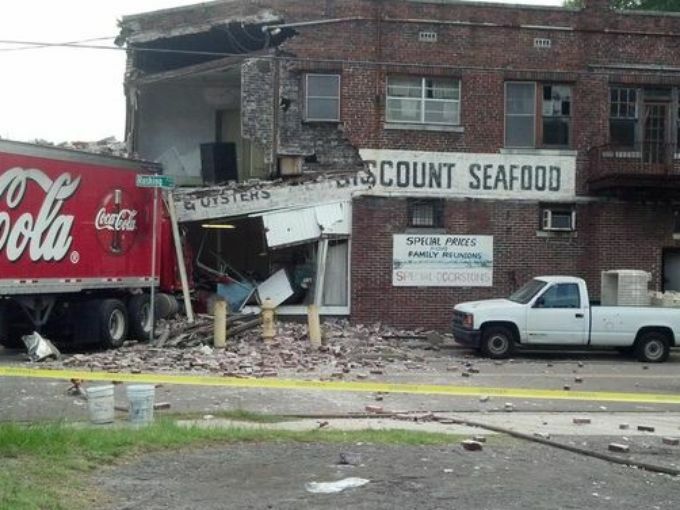 Last week in Jacksonville, Florida, a Coca-Cola truck was caught on camera first hitting a Jacksonville Transit Authority bus and then crashing into a brick walled fish market, causing the establishment to collapse. The store, New Town Fish Market, was located on the 1300 block of Beaver Street and North Myrtle Avenue and had been around since World War 2. Many local residents considered it a local landmark. With the collapse, authorities deemed the building unsafe, which led to its demolition the next day. All in all, 5 people were injured— 2 inside of the building and 3 on the transit bus. Calvin Hollis, the driver of the Coca-Cola truck, however, emerged unscathed. According to reports, Hollis told authorities that he lost control of his vehicle when a wasp flew into the cab. He was cited for reckless driving, which was not the first time. This was Hollis’ 6th citation, and the second time that one of the citations was linked with a crash. This entry was posted in Video and tagged calvin hollis, coca cola, fish market, jacksonville. Bookmark the permalink.